Around town, good choices in ascending order of expense are El Moro, the Mission, Santiago's, La Choza, Ernesto's Fajitas, Joe's Place, the Coral Reefer, numerous interesting Italian restaurants, Prima Trattoria, Rolandi's, Pepe's Grill, Cafe del Puerto, and the excellent new wave cuisine of Gallito Sol. One of my all-time favorites is the rustically romantic Cabana del Pescador (the Fisherman's House). It's about two miles north of town, on the road along sea. All they serve is lobster - you select your tail and pay by its weight. Bring someone you love and give this place a try�by candlelight no less. Fans of Costa Brava take note, due the new International Pier constructed downtown they have been forced to move to a new location, after 15 years of serving many thousands of divers their morning coffee, $2.00 breakfasts, and $1.00 beers!! Attention Cozumel Shoppers - Others may prefer to partake of the prodigious shopping opportunities Cozumel offers. If you like silver jewelry, colorful clothing, a wealth of Mexican handicrafts, or just "five t-shirts for twenty dollars," you'll find yourself in shoppers' heaven as you stroll through street after street of "blue light specials." As the friendly storekeepers tout, "it's so cheap, it's almost free." I've always enjoyed a bit of haggling in the crowded shopping stalls of the Mercado de Artesanias (Artisans Market). But an expanding area of vehicle-free walking streets has sprouted up around the Town Square with scores of interesting shops to be investigated. While the steady stream of cruise ship traffic has cut into my success at bargaining, you can still have fun and shave a few pesos by haggling a bit over the price. If you don't offer half the originally quoted price, and end up compromising somewhere in the middle, you'll be leaving money on the table, while disappointing the sporting nature of the seller. Cultural Opportunities - When you're not shopping, diving, dining, or dancing, Cozumel still has some special surprises in store for the intrepid traveler. For starters, there's wonderful live Mexican music everywhere, with groups of talented Mariachis entertaining in the restaurants and playing for tips in the street, as an excellent Ballet Folkloric Troupe performing the traditional dances of Mexico and the Caribbean. On weekend evenings there are often fiestas staged on the pavilion in the middle of the town square. These events are patronized by tourists and locals alike. You'll see Cozumel's children dressed in their Sunday best, and teenage girls making the traditional paseo around the square under the watchful eyes of their grandmothers. When the band starts to play, feel free to join in the dancing and revelry. You'll soon feel like a Cozumele�o yourself. 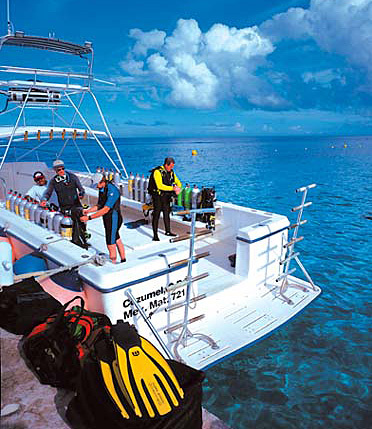 The Bottom Line is more than just Bottom Time - Cozumel has plenty to offer for divers, snorkelers, sun worshippers, and water sports enthusiasts. You'll also enjoy great dining, happening nightspots, fun shopping, and enlightening cultural opportunities. The people are friendly, and most everyone speaks English, though I encourage you to try out your Spanish. Even if you only know a few words, the effort will be appreciated. In the final analysis, Cozumel is close to the U.S., easy to get to, and just plain and simply good fun! So don't keep putting it off until mana�a... Enjoy Cozumel!